W is the genre-subverting, mind-blowing Korean drama that out-inception’d Inception. Until the end. Still, when the ride is so fun and convention-breaking, a perplexing ending doesn’t negate the entirety of what went before. Luckily she’s a doctor. About to save the character she dreamed up as a teenager. That her father made famous. In quick summary: Kang Cheol is the hero of a bestseller manhwa, or graphic novel. He’s got the hero’s typical tragic backstory, dabbles in vigilantism, heads a multi-million dollar tech company, and is now a hero to and beloved by all, both within his world and by the real world fans of his story. Oh Yeon-Joo is the daughter of the manwha’s author Oh Sung-Moo and also one of its biggest fans. And then one day she’s sucked into the graphic novel, saves Kang Cheol’s life, and is spat back out into the “real” world again. The obvious question to follow is “what is real” but that’s not the only thread W follows. It also takes a similar tack to the underappreciated Stranger Than Fiction and explores what a person might do when they find out they’re an unwitting character in someone else’s story. But even that isn’t the most compelling aspect of W. The most fascinating aspect of the show – and, alas, ultimately what it fails at in a spectacular unintentional meta tragicomedy – is its scrutiny and evisceration of flawed storytelling. This plays out the most in the case of W’s villain. The purpose of Kang Cheol’s character and only point of his story has been to find the person who murdered his family. No suspects nor evidence have ever been found. Author vs. character, god vs creation. That’s because none exist. Oh Sung-Moo killed off Kang Cheol’s family because that’s what you do – because that’s a common, and in his case, lazy method for driving a hero’s motivation. Sung-Moo then tries multiple times to kill off Kang Cheol – which Yeon-Joo keeps thwarting every time she’s sucked into the manhwa – because he realizes he’s written himself into a corner. He just wants to stop (and later is terrified when his creation seems to be turning real), and thinks abruptly killing off the main character will end the story and solve his problems. When Kang Cheol discovers he’s a manhwa character and makes it out into the real world he tracks down Sung-Moo to confront him and demand the name of his enemy. Sung-Moo can’t give it. There is no villain. Until it manifests itself as a hooded, shadowy figure and begins terrorizing the heroes. If Kang Cheol and his world are becoming real then the villain has to somehow, and it goes on a rampage because that’s all it knows how to do. There’s no logic or pattern to its actions because Sung-Moo never had any. Walk into a bookshop, discover piles of graphic novels about your life, nbd. In a similar but much more vicious vein is what happens to the manhwa’s female lead Yoon So-Hee. When it becomes clear that Kang Cheol’s romantic interest lies with Yeon-Joo, So-Hee literally starts to disappear. Her only reason for existence was to be Kang Cheol’s long-drawn-out love interest. Because the narrative has no other place or role for her, when that purposes ceases, so does she. It’s a blistering criticism of female characters created only as love interests. 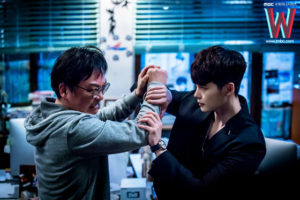 The fact that the explanation for all of these happenings – why a digital drawing pad can suddenly become a portal between two worlds, how detailed and encompassing Kang Cheol’s world truly is (given that characters disappear and time skips when not relevant to his story), how a nonexistent villain comes to life, etc. – never comes does ruin elements of W.
W author Song Jae-Jung’s tackled mind-bendy plots with romance before, in Nine and Queen In-Hyun’s Man. While the latter ultimately failed at sticking to its own rules as well, there we had a romance so epic and swoony most of us didn’t care if literally no explanation was given so long as the heroes got to be together at the end. But W didn’t pour its soul into the romance the way Queen In-Hyun’s Man did. So although Kang Cheol and Oh Yeon-Joo were cute, their relationship wasn’t the main purpose of W and thus their ending up together wasn’t good enough to overcome the total lack of story payoff. When reality and comic book collide. It raises the question of whether or not said lack of payoff – utter lack of explanation, really – ruins everything that went before. It certainly dulls the edge of the commentary about bad writing. In that way W becomes a lesson unto itself, sort of like the Disney film Enchanted, wherein it falls prey to the very things it earlier critiqued so well. But W is still worth watching. The other questions it raises and explores are still fascinating. What would it be like to suddenly be confronted by your own creation, framing you as a malevolent god? If a world you created suddenly became real, but still adhered to some created constructs, is it real, and what are the moral implications of making changes to that world? These questions are given some better answers. Between that, its slick production, and a few sweet moments between the two leads, W goes down as a genre-expanding buzzworthy kdrama. Maybe I can help you overcome your disappointment on some points. I know Song Jae-Jung’s writing quite well. She gives few direct explanations. But the absence of obvious explanations does not mean that they do not exist. A writer of her level knows what she’s doing. Maintaining a level of ignorance keeps the mystery alive. It is not suitable for the general public, but it is a delight for those who love and understand this kind of work. The drama can be easily reviewed a very large number of times. Only in this way can we end up making a real criticism of it. This is why most critics of various blogs have been unable to do so. We can see that they are not much better equipped than the average spectator. Many details lost in scenes, or some replicas, allow to assemble the missing elements. There is a lot of thinking to do, like an investigation. The overall cohesion is remarkable in the end, we can say that it is genius. Thank you for your article, which covers a lot of positive points.